Mainstream media coverage of the showdown in southern Nevada over Cliven Bundy’s cattle has so far been scrupulously balanced. 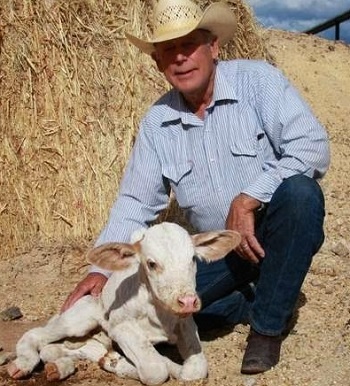 Most outlets – including local TV stations from nearby Las Vegas, as well as cable news outlets CNN and MSNBC – have presented Bundy’s belief that the U.S. government has no jurisdiction over the land on which he grazes his cows as well as the government’s explanation of how it is enforcing land use rules fairly for everyone. The same cannot be said for right-wing media outlets, led by Fox News, which have steadily characterized the Bundy family as heroic patriots standing up to a tyrannical government. A number of far-right pundits have even been urging people to go to the scene in Clark County to make their presence known. VAN SUSTEREN: There’s a court order that says that the federal government can do this. So what’s your response to that. CLIVEN BUNDY: My response is it’s the wrong court. I’ve never had my due process in a Nevada state court, a court of competent jurisdiction. AMMON BUNDY: Hey, uh – I like my Dad’s little story he uses to explain the situation. If someone came in and busted into my house and abused my children, and I call the cops, they don’t respond. And then I take them to court, I show up in the courtroom, look on the stand, and it’s the very person that abused my children looking down at me in a black robe. How in the world are we going to get justice in that court? The Bundys have been receiving support from other right-wing sources, including the Koch-sponsored Americans For Prosperity, which has acted as public boosters for the family’s activities. AFP’s Nevada chapters have been actively promoting anti-Bureau of Land Management stories through social media. At conspiracy-minded Alex Jones’ Infowars, there has been a steady flow of antigoverment “Patriot”-oriented stories, including one in which Bundy called on the local sheriff to begin arresting federal agents. Indeed, a large number of additional protesters did arrive at the scene today, but fortunately things remained peaceful.